It's time for this week's Table Top Episode 5 hosted by Star Trek's, Wil Wheaton on Felicia Day's YouTube Channel, Geek and Sundry. A super star cast of players have fun playing the game Munchkin from Steve Jackson Games. Joining Wil Wheaton are: Steve Jackson (Game Designer Guru and Munchkin creator), Felicia Day (actress, producer, writer), and Sandeep Parikh (actor and creator of Legend of Neil). 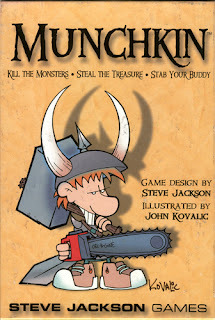 Come and see us for the Munchkin games. We also have a demo copy available for you to try. While you're in the store we'll be happy to teach you the rules to the game.